The cry of coastal PNG people “Atung istap!” (Look, there’s a ‘tuna boil’), could be just a thing of the past. Further to my 22 May 2011 article in PNG Attitude http://asopa.typepad.com/asopa_people/2011/05/tuna-industry-must-not-strip-png-resources.html ‘Tuna industry must not strip PNG resources’, there is now an increasing concern about the sustainability of world Tuna stocks and specifically about Pacific Tuna stocks. ‘Five of eight tuna species are now threatened or nearly threatened with extinction due to overfishing’, according to the Red List of Threatened Species, compiled by the Swiss-based International Union for the Conservation of Nature (IUCN). ‘Between 1940 and the mid-1960s, the annual world catch of the five principal market species of tunas rose from about 300 thousand tons to about 1 million tons, most of it taken by hook and line. With the development of purse-seine nets, now the predominant gear, catches have risen to more than 4 million tons annually during the last few years. Of these catches, about 68 percent are from the Pacific Ocean, 22 percent from the Indian Ocean, and the remaining 10 percent from the Atlantic Ocean and the Mediterranean Sea.’ the International Seafood Sustainability Foundation is quoted as saying in Wikipedia. In an article titled ‘Tuna species under threat’ dated 8th July 2011 by AFP, is claims: ‘Up to 90 percent of many large, open-water fish have been depleted by industrial-scale fishing over the last half-century, and marine scientists warn that continued harvesting could lead to irreversible declines of some species. Because many are at the top of the food chain, their disappearance could also disrupt delicately balanced ecosystems. In the case of tuna species, "the most efficient way to avoid collapse is to shut down the fisheries until stocks are rebuilt to healthy levels," the researchers concluded. So where does that leave PNG? Well according to the Managing Director of PNG Fisheries Authority, Syvester Pokajam, four new tuna processing plants will open shortly in PNG. Mr Pokajam claimed PNG would be able to sustainably manage its national tuna stocks however tuna is a pelagic fish and travel long distances through many different national economic fishing zones. So hopefully the history of being able to sustainably manage marine resources won’t mimic the history of managing PNG forests, that other sustainable national resource? MANAGING DIRECTOR of the National Fisheries Authority, Sylvester Pokajam, has said there will be four new tuna canneries and processing plants opened soon in PNG. This will significantly increase local employment and production. Mr Pokajam highlighted that PNG will soon overtake the Philippines in tuna production and become second only to Thailand. In his presentation to a European conference in Brussels, Mr Pokajam indicated PNG was currently undertaking a number of projects to ensure it will be able to manage the sustainable harvesting of tuna stocks. While this is good news, it does beg the question of what evidence was brought to the table before the decision was made to go ahead with the new processing plants. While PNG will benefit from increased employment opportunities, there have been media reports that overseas workers are being employed in this industry. In addition, while PNG will earn valuable foreign exchange from the export of canned tuna, if future studies indicate a decreasing resource, will a future government be able and prepared to restrict or halt production? Hopefully, future PNG populations will continue to enjoy what is currently available. The Philippines is well known for having effectively stripped many of its marine resources beyond the point of no return. We hope this will not be allowed to happen in PNG. 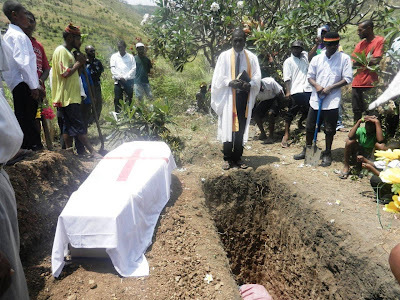 The late photographer Auri Eva, who was laid to rest yesterday (Monday) at Kirakira Cemetery along the Pari Road, has “become another victim of the madness that we call public health care in this country”, according to The National’s editor-in-chief Frank Kolma. He said in January, PNG journalism lost another friend and colleague in The National’s business editor Yehiura Hriehwazi, because of the very same reason: no medication. “Auri was in tremendous pain these past few weeks, I imagine,” Kolma said at yesterday’s funeral service at Evegima United Church, Joyce Bay. “He had cancer of the pancreas, one of the organs that help our digestive system. “When I met him he was on morphine, one of the strongest pain killers. “He carried that pain for a long time and went to many hospitals seeking medical opinions. “Always, he got prescriptions for a lot of medicine. “When he got x-ray and it was finally found that he had cancer of the pancreas, his condition was quite advanced already. “That is what he told me and I was too respectful to ask him if that meant he had very little time left. “But he and I knew. “His eyes told me that and we shared a tear or two. “Auri was discharged a week after I met him, on August 8. “The hospital had run out of medicines, he was told. “He was basically told by the biggest hospital in PNG to go home and await death. “And that is what has happened. “When Yehi died in January, he was looking for medication and health care and I spoke about this at his funeral. “I said at the time that many more of us here present will also be taken prematurely for the same outrageous reason. “Auri has become another victim of the madness that we call public health care in this country. Eva was a career photographer who touched the lives of many people, elder brother Miri Eva said at his funeral service yesterday. 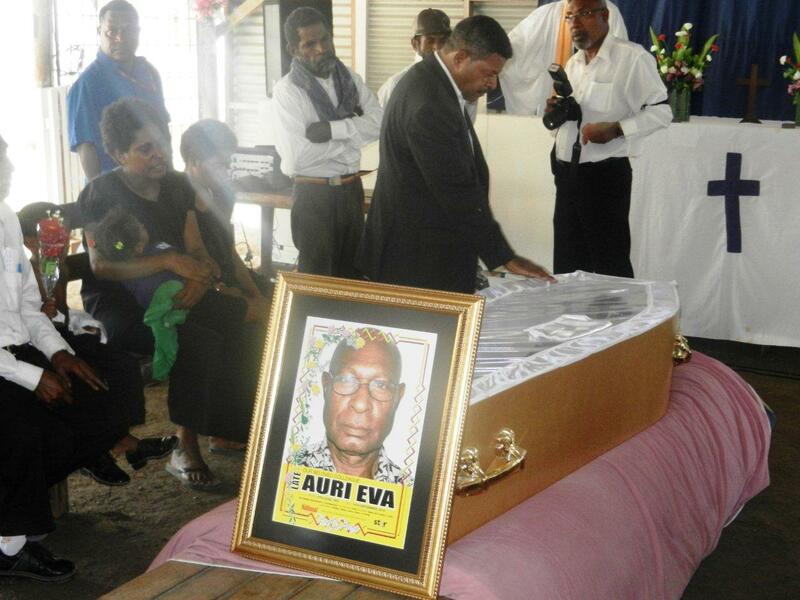 “During his term of employment, late Auri Au Eva was a longtime photographer, having served the Office of Information, the South Pacific Post, Niugini Nius, Times of PNG, Wantok Niuspepa, and most recently The National. Eva was there with reporter Sinclair Solomon in 1980 when the Kumul Force landed on the Vanuatu island of Espirito Santo and put down the rebellion of Jimmy Stevens. “That action gave our Melanesian neighbor independence,” Kolma said. 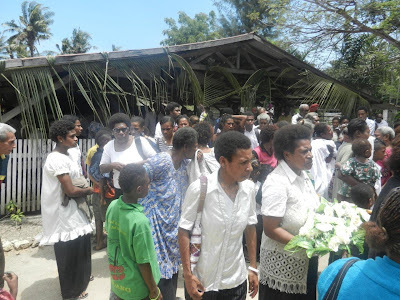 “A few weeks before his death, on his sick bed at POM Gen, Auri told those of us who went to visit him there that the Vanuatu assignment was his best. Eva was born on October 25, 1956, and passed away on September 13, 2012, just short of his 56th birthday. In 1963, at the age of seven, he started attended Moveave Primary School and completed Grade 6 in 1969, however, could not get a place at Kerema High School because of lack of space. In 1971, he moved over to Port Moresby, enrolling at Kavari Vocational Centre at Hanuabada in 1972, where he obtained a certificate in photography. He leaves behind his wife, four daughters, five grandchildren, his mother, three brothers and two sisters. UNRELIABILITY of power in Port Moresby has forced PNG Power to implement rolling blackouts, according to the Asian Development Bank, The National reports. The ADB, in its Finding Balance: benchmarking the Performance of State-Owned Enterprises in Papua New Guinea report, says the technical performance of PNG Power is on par with other utilities in the region, however, lags behind in others. It has combined transmission and distribution losses of 20%, but a lower load factor of 41% compared with an average of 66% for the other utilities. “Because of PNG’s difficult topography, a relatively-low proportion of the country has access to power; and a rapidly-growing demand in the capital city has forced PNG Power to implement rolling blackouts,” the report said. The report said PNG Power’s operating ratio – which records total operating costs as a percentage of total operating revenue – was comparatively high at 90%, particularly as it generates 83% of the power for its main grids from hydro sources. “Most of the other power utilities in this study, including PNG Power’s smaller grids, are either solely or largely reliant on diesel generation,” it said. “Tonga Power, with 100% diesel generation, achieved an operating ratio of 87%. “PNG Power’s cost structure does not seem to benefit from economies of scale. “Fiji Electricity Authority (FEA), with similar annual power-generation volumes, operates at a cost per kilowatt-hour (KWH) of power sold at US$0.12. “PNG Power’s cost of power sold at US$0.30 per KWH is more in line with the much-smaller power utilities. “Marshall Islands Energy Company and Solomon Islands Electricity Authority, which generate just 20% of the power generated by PNG Power, operate with costs of production of US$0.41 and US$0.54 per kWh. “The Electric Power Corporation of Samoa, which generates 13% of the power generated by PNG Power, has a cost of power sold at US$0.43 per KWH.. The report says PNG Power bought 163,517 megawatt-hour (MWh) from an independent power producer in 2010, about 20% of total production. PNG Power had loans totalling K313 million on its balance sheet as of Dec 30, 2011, according to the Asian Development Bank (ADB), The National reports. The ADB, in its Finding Balance: Benchmarking the Performance of State-Owned Enterprises in Papua New Guinea, said PNG Power paid only K6.2 million in interest – a heavily subsidised debt - which represented an average debt cost of 1.97%. 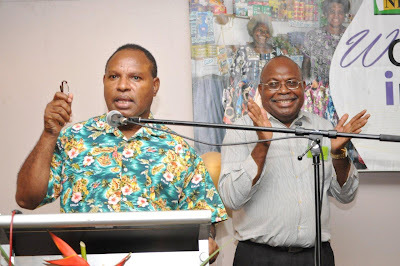 The report said PNG Power also carries a heavy financial burden due to the large number of non or slow-paying customers, which include poor-paying government departments and security challenges associated with disconnection activities. PNG Power was one of three state-owned enterprises (SOEs), the others being Telikom and PNG Ports that contributed most of the profits generated by the PNG SOE portfolio from financial years 2002-10. “PNG Power’s comparatively poor operational performance does not lead however to the very low financial returns found in Fiji, the Marshall Islands, Samoa, and Solomon Islands and this is due in part to its heavily-subsidised debt,” the report said. “With more than K313 million of debt on its balance sheet as of Dec 30, 2011, it paid only K6.2 million in interest, which represented an average debt cost of 1.97%. “If PNG Power paid a commercial rate of interest, the estimated adjusted return on equity for 2010 would have been 2.2%. The report said PNG Power, the largest utility in the Pacific in terms of installed capacity, performed comparatively well when measured by profitability. It had a return on equity (ROE) of 5.7% and return on assets (ROA) of 3% in 2010 – second only to Tonga Power with a ROE of 7.5% and a ROA of 4.8% for the same financial year. “Fiji Electricity Authority (FEA) – the second largest utility in the Pacific – is much less profitable than PNG Power and Tonga Power, returning only 2% on equity and 1% on assets in 2010,” the report said. “This may be largely impacted by price regulation, as power tariffs in Fiji are 50% lower than for residential users in PNG whereas in Tonga the tariffs are 25% higher than in PNG. “FEA is also carrying a significant unfunded community service obligation, which the board estimates costs the company US$16.8 million in lost revenue per year. “The profitability ratios are, however, the only benchmarks on which PNG Power seems to outperform most of its Pacific neighbours. “PNG Power’s operating ratio – which records total operating costs as a percentage of total operating revenue – is comparatively high at 90%, particularly as it generates 83% of the power for its main grids from hydro sources." Lest we forget: It was on this day, September 19, 1994, that we lost the beautiful town of Rabaul in the double volcanic eruptions of Tavurvur and Vulcan. The Asian Development Bank (ADB) had recommended that the government consider winding up its General Business Trust (GBT) and reconstitute Independent Public Business Corporation (IPBC) as a company that owns state-owned enterprises (SOEs), The National reports. The ADB, in its Finding Balance: Benchmarking the Performance of State-Owned Enterprises in Papua New Guinea released last Thursday, said the analysis undertaken through this study showed that the trust structure added no benefit to the effective control and oversight of PNG SOEs, nor did it enhance their commercial status. “What it has done is add another level of legal and operational complexity that has assisted in shrouding what is actually happening with and within the SOE portfolio,” the report says. The report noted the PNG government has made remarkable progress in strengthening the framework for SOEs over the last 12 months. · Preparation of amendments to the IPBC Act to strengthen the accountability mechanisms of the SOEs. “More remains to be done to complete the framework, including the development of dividend policy guidelines for the delivery of community service obligations (CSOs) by SOEs, and a public-private partnership policy; increased transparency of SOE performance; and strengthened governance and implementation of an on-lending policy,” the report says. · Contribute to the finalisation of the CSO, dividend, and onlending policies for government consideration, in consultation with the treasury. Papua New Guinea’s National Development Bank has the “most-atypical business model of the four banks” studied in the Pacific, according to the Asian Development Bank, The National reports. “It (NDB) receives most of the money it lends through government grants that are designated for specific ‘loans’ rather than making and assessing loans based on a traditional development bank model,” the report says. “It does not borrow to support its lending activities as these are financed by ‘client’s trust funds’ amounting to US$5.4 million, on which it appears to pay no interest. “Its assets include 36% property and plant, 17% deferred tax benefit, and 31% in loans. “The NDB’s lending activities have been consistently loss-making, with the bank carrying US$52.8 million of accumulated loan losses in FY (financial year) 2009, almost equal to its paid-up capital. “From FY2002-FY2009, NDB also wrote off K34 million in bad debts and achieved the lowest return on equity (ROE) among the banks reviewed in this study. “The NDB has incurred operating loss annually from FY2002-FY2009. The Asian Development Bank (ADB) says the performance of the National Development Bank, when compared with other development banks, “is one of the worst in the Pacific”, The National reports. In its Finding Balance: Benchmarking the Performance of State-Owned Enterprises in Papua New Guinea report released last Thursday, the ADB highlighted that NDB generated losses of K70.6 million over the FY (financial year) 2002-2010 period, while receiving a total of K111 million in government grants to onlend to selected beneficiaries. The NDB last February announced a record profit for the bank of K9.4 million in 2011, a dramatic turnaround after a decade of consistent losses, but did not elaborate on the key drivers of this turnaround. “It appears that most of these funds have not been recovered, and more funds are beingchanelled every year with similar results,” the report said. “The 2012 national budget has allocated a further K130 million for NDB to onlend to various beneficiaries, of which K100 million is earmarked for the agriculture sector. “NDB’s continued role as the preferred channel for the government’s subsidised credit programmes is difficult to justify, based on its past performance. “In FY2009, NDB reported K109 million (US$52.8 million) in accumulated losses. “NDB’s performance, when compared with other development banks, is one of the worst in the Pacific and indeed is far inferior to the Tonga Development Bank (TDB) and the Development Bank of Samoa (DBS), which returned an average return of equity (ROE) of 11% and -0.8%, respectively, during the FY2002-FY2009 period compared with NDB’s -38%. “In the benchmarking sample of development banks, NDB only outperformed one bank, the Development Bank of Solomon Islands (DBSI), which was closed in 2007. “While the financial statements of NDB for FY2011 were not available for this study, NDB’s chair announced a record profit for the bank of K9.4 million in 2011, a dramatic turnaround after the bank’s decade of consistent losses. The ADB says a thorough review of the NDB is needed to shore up ongoing losses, reduce the government’s fiscal risks, and assess its effectiveness in delivering mandated lending programmes. The ADB stressed it was critical to bring NDB’s governance structure and reporting mechanisms in line with those of the other state-owned enterprises (SOEs), so that Independent Public Business Corporation (IPBC) could effectively execute its role of SOE monitor and shareholder representative.